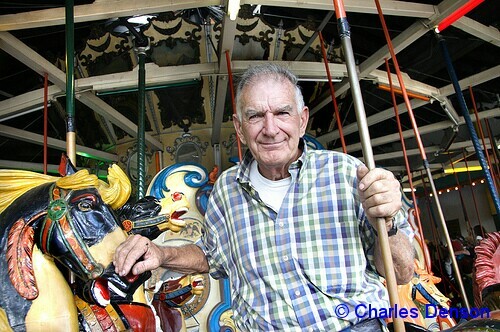 We’re sad to report that James Carchiolo, affectionately known in Coney Island as Jimmy Balloons, has passed away. He had been at Coney Island Hospital for four weeks and was about to be moved to a hospice. 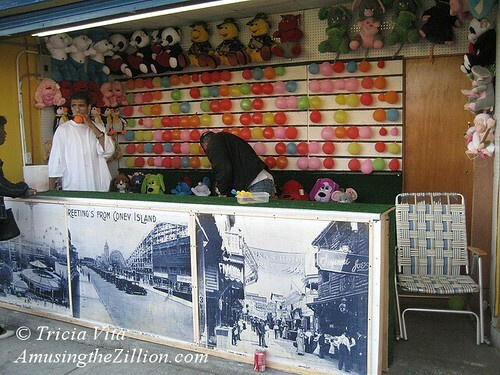 Jimmy is among the few remaining old-timers operating games in Coney Island. He was 71 years old and was a game operator in Coney for over 50 years. 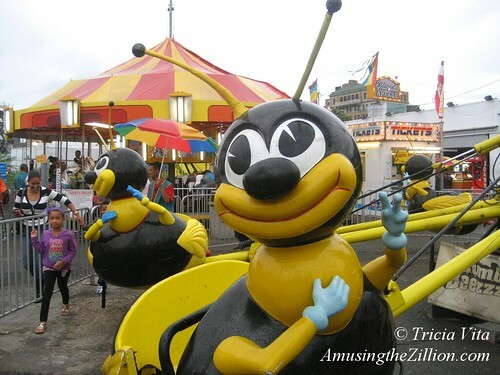 ATZ has taken many photos of Jimmy and his Balloon Dart over the years at various locations, including two spots on the Bowery and on Jones Walk under the Wonder Wheel “Thrills” sign. The spot long occupied by his Balloon Dart in the century-old Henderson Building, demolished by Thor Equities in 2010, is now the Brooklyn Nets Shop in Thor’s retail building. That fact pretty much sums up why indie game operators are disappearing from the new Coney Island. 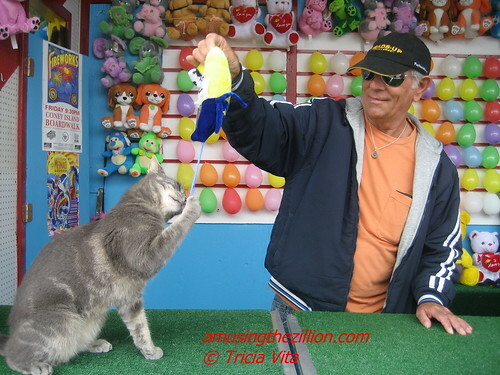 Born and raised in Coney Island, Jimmy was a survivor who relocated from the Henderson to property leased by Manny Cohen’s Coney Island Arcade, where Target the Coney Island Cat helped him call people in to play. 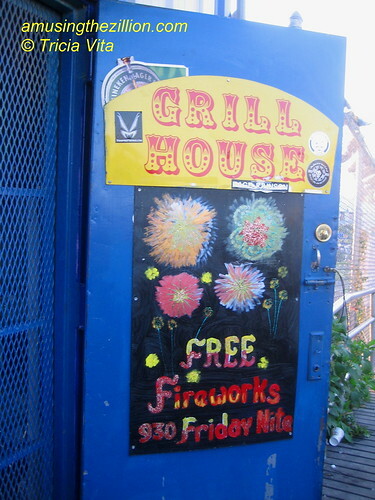 After Manny lost his lease, Jimmy moved in 2013 to a spot on Jones Walk owned by Deno’s Wonder Wheel Park. Sadly, this year for the first time in his long career in Coney, Jimmy missed operating his Balloon Dart on Opening Day. Rest in peace, Jimmy Balloons. You will be missed. Visitation will be Sunday, April 3rd, 2-5pm and 7-10pm at the Cusimano & Russo Funeral Home, 2005 West 6th Street, Brooklyn. The Funeral Mass will be on Monday, 10:00 am at the Shrine Church of Our Lady of Solace, 2866 West 17th Street, Coney Island. Interment to follow in the Cemetery of the Resurrection, Staten Island. 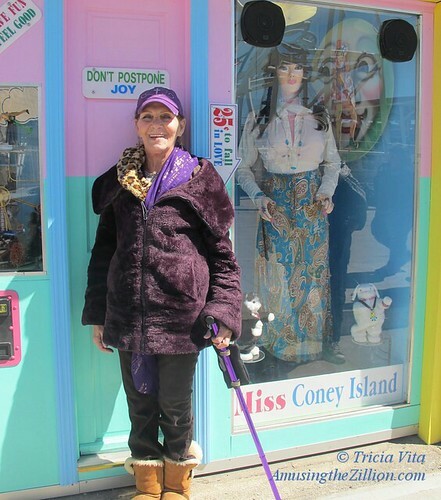 Coney Island lost an angel and heaven gained one on Thursday. Pastor Debbe Santiago, who founded Coney’s Salt and Sea Mission over 30 years ago, passed away after battling cancer. The wake will be on Thursday, February 11, from 12pm- 5pm, followed by a funeral service from 5pm -6pm at the Salt and Sea Mission, located at 2417 Stillwell Avenue. A memorial service will be held at MCU Park, 1904 Surf Avenue from 6-7pm. Pastor Debbe’s experience as a former homeless drug addict who turned her life around after reading the Bible gave her deep empathy and compassion for all. 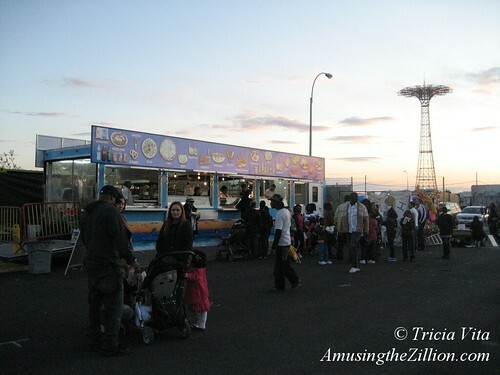 Every Palm Sunday for the past 30 years, Pastor Debbe has officiated at the Blessing of the Rides at Deno’s Wonder Wheel Park on Coney’s Opening Day. The ceremony consists of a prayer of invocation as well as the Fire Department Color Guard, speeches by elected officials and a ribbon cutting, followed by free rides, toys and Easter bags for children from the Salt and Sea Mission. In the following video recorded at the 2015 ceremony, Santiago explains how the annual tradition got started. She asked Deno Vourderis, the park’s founder, if she could bring some kids from the Mission to ride the rides. “And he asked if I had 500,” she says. 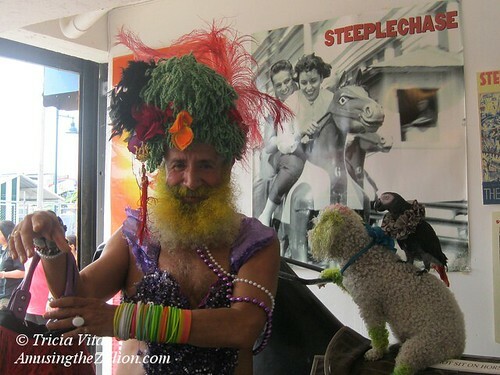 Today we received the sad news that John Ciarcia, known to all as Cha Cha of Coney Island, passed away this morning. He had recently undergone surgery for cancer and was about to start a course of chemotherapy, a family friend told ATZ. Update: Services will be held after Thanksgiving in Little Italy. Viewing will be Monday, November 30, and Tuesday, December 1, from 5-9pm at the Old Saint Patrick’s Cathedral recreation hall behind the church. The funeral Mass will be on Wednesday, December 2, at 10:30am at the Old Saint Patrick’s Cathedral, 263 Mulberry Street between Prince and Houston. 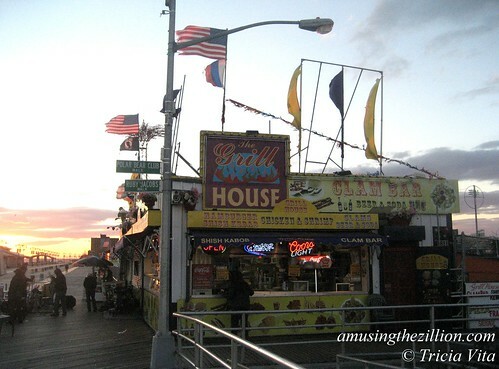 Cha Cha’s Club Atlantis on the Coney Island Boardwalk, the “Home of Wild Women and Wise Guys,” closed at the end of the 2011 season after losing its lease. 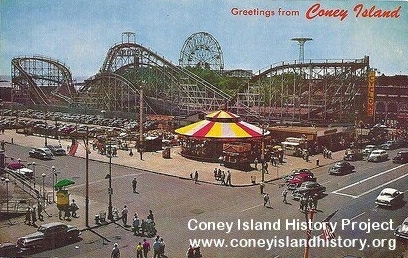 It was one of the “Coney Island 8” evicted by Zamperla. 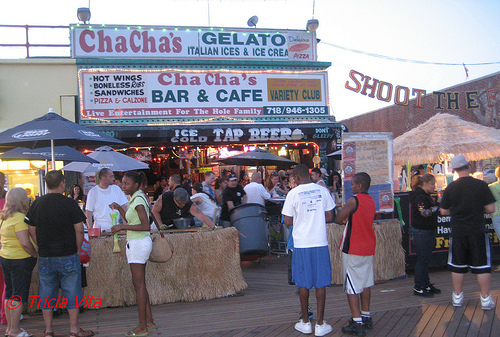 Cha Cha’s Coney Island Seafood Bar & Pizzeria relocated to Surf Avenue in 2012 but never re-opened after Sandy. This post will shortly be updated with an obituary. 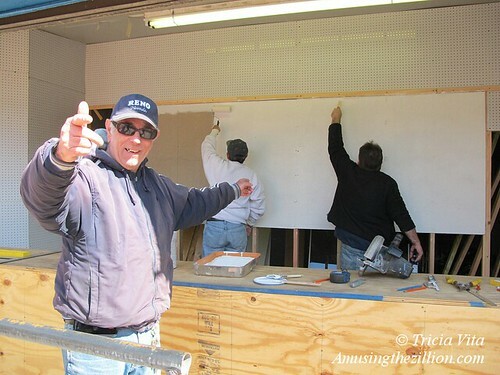 In the meantime, here’s a 2009 photo of Cha Cha’s the way we like to remember it…. 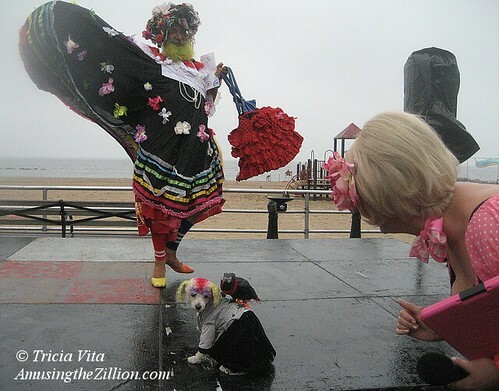 On Memorial Day in Coney Island, the colorfully costumed Oswaldo Gomez aka Miss Colombia paraded by and we scurried to take a photo. Rosita the parrot was as usual perched on his head. Where was Carino the poodle? “Carino died,” Oswaldo said. “He was 17.” That’s the equivalent of 84 in human years. The poodle passed away earlier this month. It was on Memorial Day Weekend in 2008 that we first became aware of Miss Colombia and his pets as a New York City phenom. The Mermaids, a male folk rock duo, were singing in front of the Cyclone when he came by, took the dog out of the carriage, pirouetted around and stole the show. The flamboyant trio have been in every parade in New York City and are the subject of their very own flickr group. 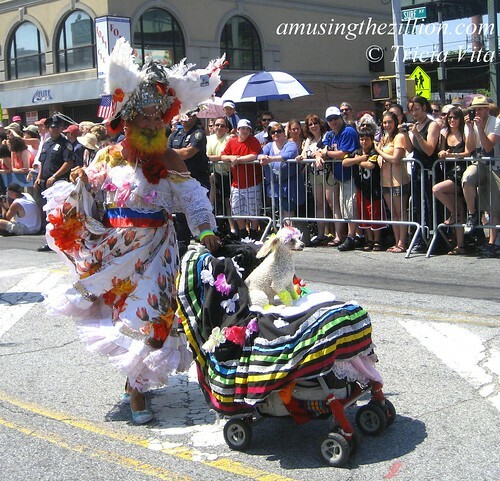 You’ve seen them in the Mermaid Parade, the Easter Parade, the Chinese New Year’s Day Parade, the West Indian Day Parade, Gay Pride, and St Pat’s. As regular visitors to the People’s Playground, the dog and the parrot got to “ride” the Steeplechase horse and the antique Whip car at the Coney Island History Project. They won first prize in the first annual Pet Day at Deno’s Wonder Wheel Park. 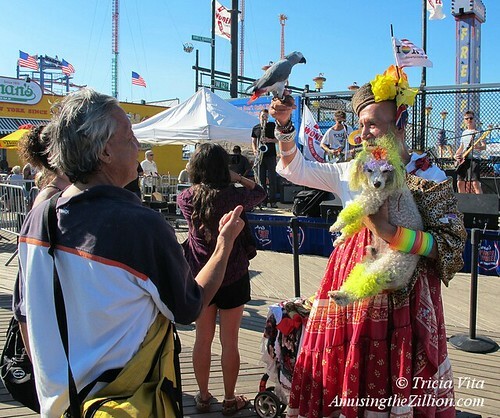 Afterwards, Miss Colombia did a victory dance while the parrot perched on Carino’s back, clasping the prize–a season’s pass to the Wonder Wheel– in her beak. Rest in peace, sweet little Carino. 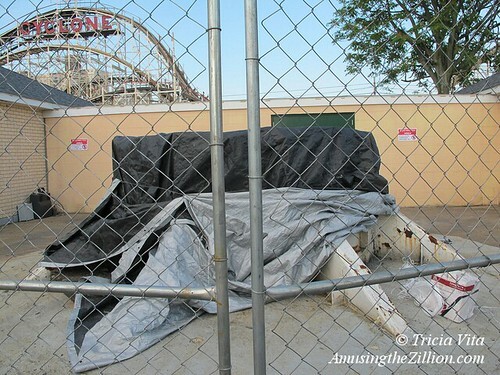 After the nightmarish July 4 Holiday Weekend demolition of the Swaying Tower of Coney Island, all that remains in Luna Park are a few feet, shown above, covered with tarp. It looks like a grave. The media appear to have lost interest in what they called “the iconic Astrotower” as soon as it was chopped down to about 90 feet, a third of its original size. News reports that “Officials have not said yet whether the tower will be reassembled or if it’s gone for good” are ridiculous. The tower was not dismantled, bolt by bolt. It was cut apart with a blowtorch and the pieces were hauled off to the Cropsey Avenue scrapyard, where fans rushed to photograph it and salvage pieces as a souvenir. Coney fans on social media are referring to what’s left of the tower in Coney Island as the Astrostump or the Lunastump. Some of our friends who live in nearby high rises and for whom the Astrotower was an intrinsic part of the skyline say something’s missing and they feel sad. It is more than sad. The Parachute Jump, sole survivor of Steeplechase, endured years of neglect and threats of demolition before being landmarked in 1988 and rehabbed in 2002. Astroland, Coney’s Island’s Space-Age theme park, opened in 1964, which was Steeplechase’s final season. For children of the late 60’s and the 1970’s and beyond, Astroland Park was Coney Island. 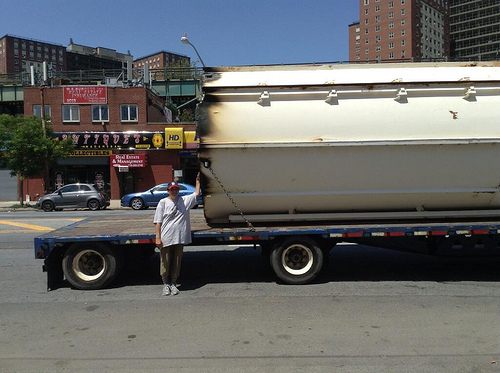 The tower was all that remained of Astroland in the new Coney Island and now it’s gone. 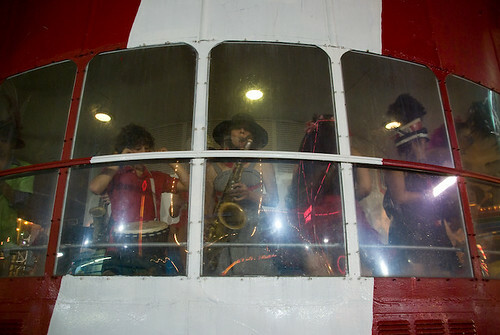 This photo and the one below were snapped by photographer Adrian Kinloch on the last day of the 2007 season, when the observation tower last operated as a ride. Astroland was built on the site of Feltman’s, the restaurant and amusement park complex owned by Charles Feltman, the inventor of the hot dog. When the Albert family decided to develop the park, Jerry Albert began making trips to the West Coast and Europe to seek out state-of-the-art rides. Designed and built by Willy Bühler Space Towers Company of Switzerland with cabins by Von Roll, the $1.7 million dollar Astrotower was the first of its kind in the U.S. when it was installed. “Who Wants An Outlandish Astrotower? Who Wants A Big Bagel in the Sky?” said an editorial in the World Telegram and Sun when the Astrotower made its debut in 1964, according to the book “Coney Island and Astroland” by Charles Denson. “There’s only one place where anyone would dare to put up such a thing, and that’s Coney Island, that land of the frivolous, where gaiety and fun have reigned for years. 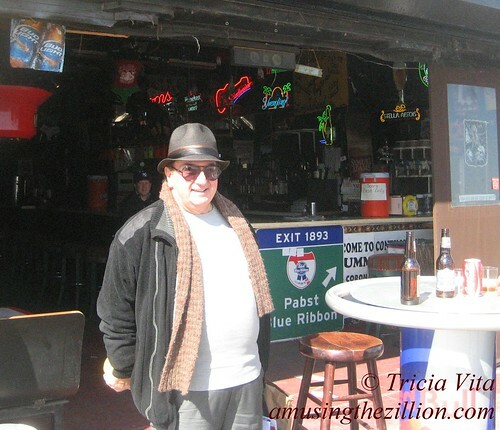 We’re glad to see the old place hasn’t lost it’s zest for the bizarre.” R.I.P. 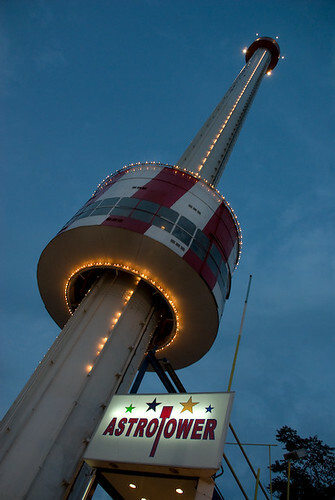 Astrotower, 1964-2013.